If you have a Japanese Garden nearby--now is the time to pay them a visit. 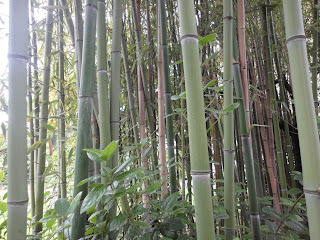 Specifically, go check out the bamboo gardens. 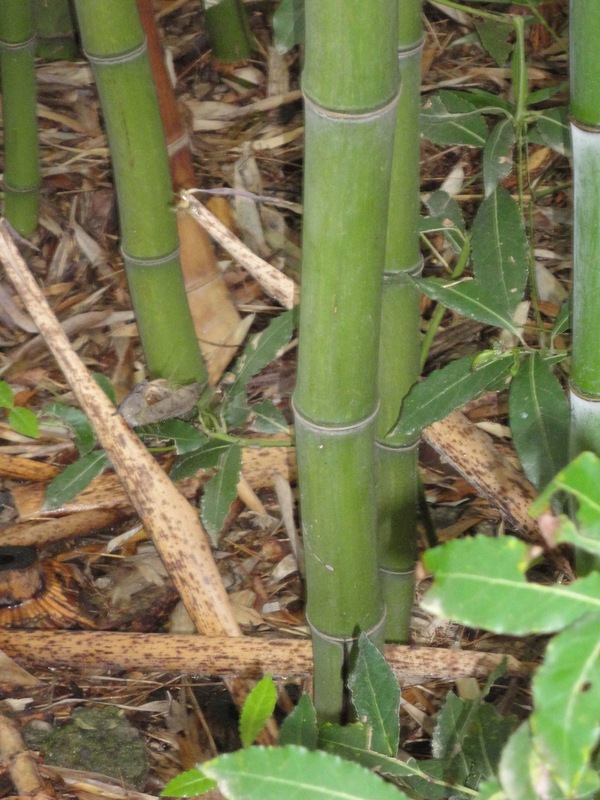 Bamboo grows about a foot a day. Botanically a grass, it has culms, long segmented stems and each of these is protected by a sheath during the growth phase and small terminal leaf that drops from the growing stalk as it gets taller, one for each segment. A good stand of bamboo will be dropping or will have already dropped dozens of these. 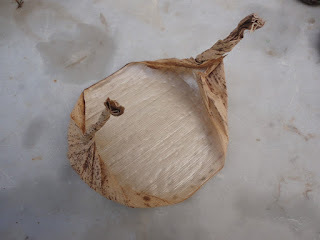 The Takenokawa, is the dried bamboo-leaf that is used to cover the baren coil and serves to help distribute the pressure while protecting the paper from the coil bumps and friction. 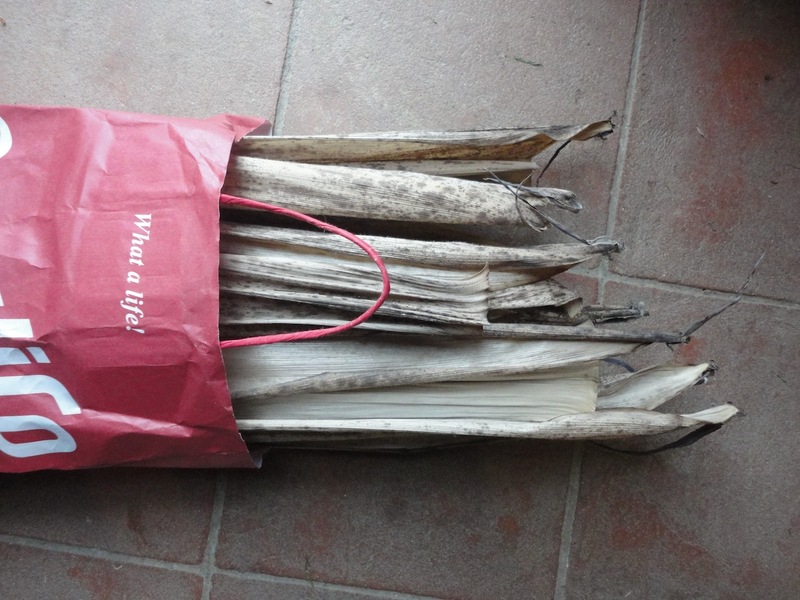 I get mine from Japan via post (Woodlike Matsumura) or from McClains in the US. They're hard to ship so end up costing about $5-7.00/each due mostly to shipping costs. (although, if I get them with a roll of paper they usually ship inside the paper roll). I usually buy 5-10 at a time. But now that I print harder--I go through them faster. My testing of a duct tape cover or the shelf paper (works pretty well) was due to the fact that I just have 2-3 left and I'm saving them for serious printing. I had another of my "Hey, these might work!" moments walking in the garden again this week and noticing the stand of bamboo that hides the old well and pumphouse. 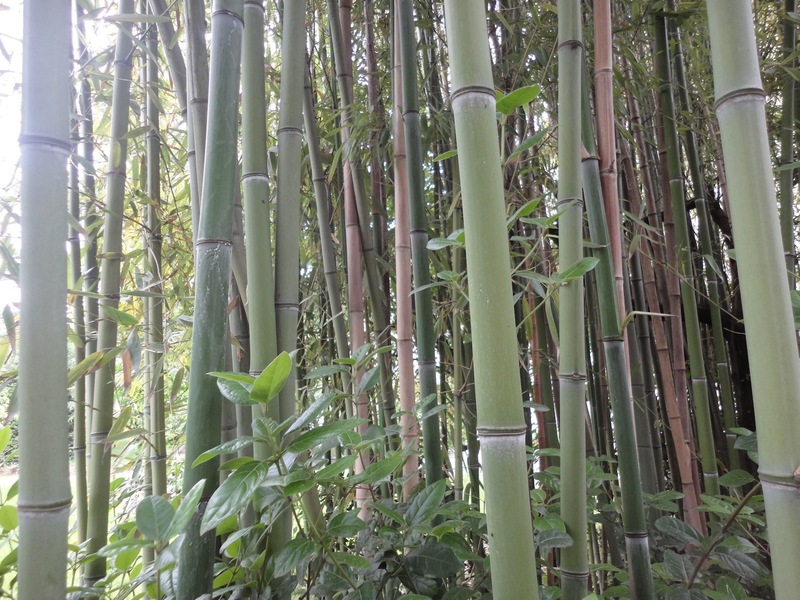 We have 2-3 patches of bamboo on the grounds. I had long ago looked at, then discarded them as a local source for Takenokawa as being too narrow. But when I covered my last baren--I was surprised how much wider it got with dampening and stretching. So I went back to the bamboo patch for another look. Most are stands of a thinner bamboo used for staking in the garden but this patch--planted probably 200 years ago to hide the even older pump/well--has quite a few thicker shoots--some a little more than 2inches/5-6cm in diameter. I looked over the fallen skins and selected out the ones that weren't damaged and that seemed to have come off the larger stems. 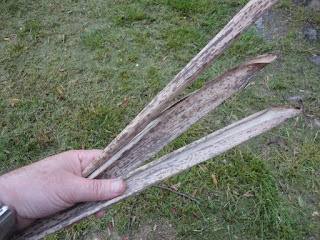 Leaf dampened under running water then carefully stretched/smoothed out with fingers. Now it's almost 11cm wide. 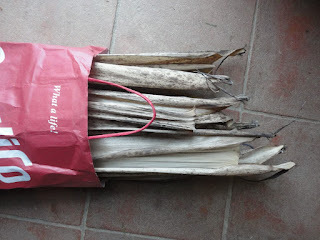 I rubbed the inside with a smooth stone to iron out the ribs/wrinkles and measured again. 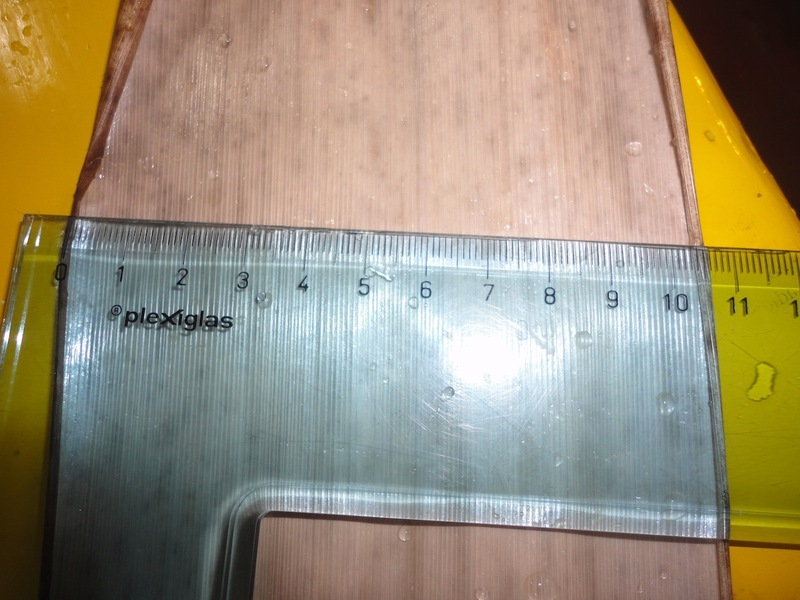 12 cm! Wow, this is going to work. 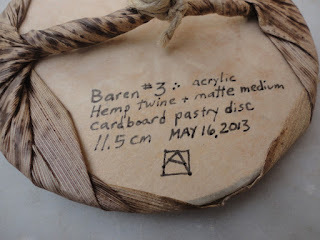 So, since I still had one left-over cardboard round and a length of twisted cord I decided to quickly put together another baren so I could test if these skins would work to cover a smaller baren....In addition, I made a few alterations from my last one to see if I can get more pressure and a more effective baren from the same materials. I coated the braided cord with acrylic medium to harden it up and stiffen the cord. 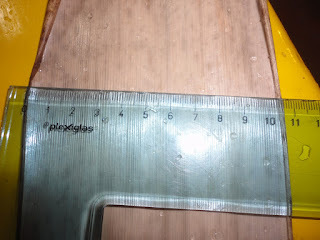 I trimmed the disc to madke it a little smaller-- 11.5cm diameter so it would better approximate the Murasaki baren I was comparing it to and be small enough for the skins I had found. I glued two thick paper concentric circles on the side the cord would be glued to to make it just a tad covex. I didn't like the shiny gold of the back---it's made to go under cakes--so I also glued a thin sheet of washi to the back just to make it less ugly. Then as just a quick trial, I dampened one of the uglier skins and quickly stretched it out by working across the grain until it opened up. Then used a river rock and a hard surface to stretch it further and smooth the grain. It went from about 9cm wide to 12cm wide and covered the baren with nothing to spare. It had a few splits but it didn't get worse or fall apart when it dried, so encouraged, I tried again with a better skin. 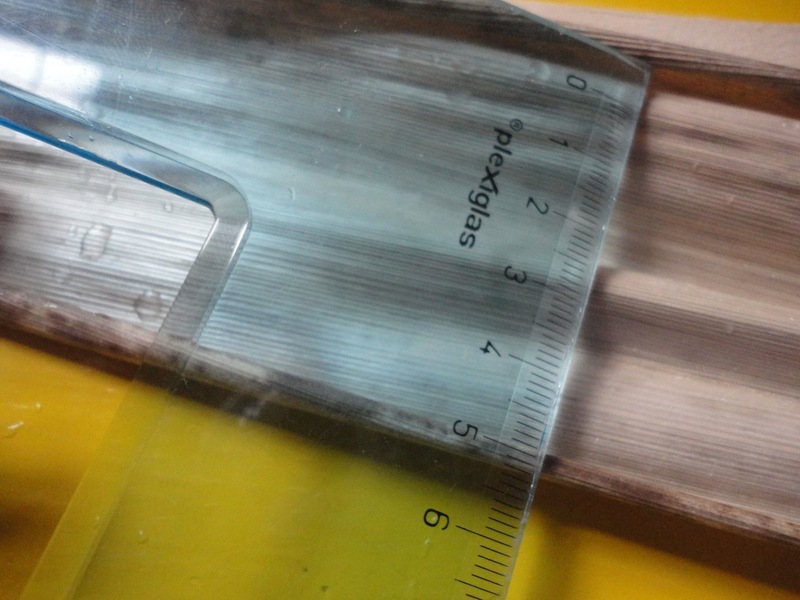 This one was JUST barely wide enough once prepped. But it's on. Very smooth and looks pretty good. Trial leaf; it fit, but had a few splits so I tried again. Tomorrow, I'll test it out. But first I went back to score a few more skins. Clever you! I looking forward to hearing/seeing how they work out.